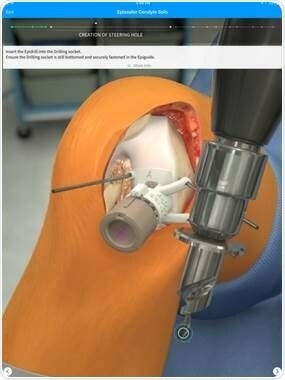 Pioneering mobile training simulation demonstrates groundbreaking technique of the Episealer patient- specific knee implants, free on iOS and Android. Today, Episurf Medical announced the public release of the Episealer surgical training simulation on the Touch Surgery app. The procedural simulation is now available to Touch Surgery’s audience of over 1.3 million users globally, which is a perfect match to the Episealer platform, a proprietary patient-specific approach to addressing knee lesions and previously untreatable joint pain problems. The growing global interest in the groundbreaking Episealer approach to preserving knee cartilage, is well suited for Touch Surgery’s massive surgical community. Episurf is committed to providing a high standard of surgical education and training as surgeons learn the Episealer patient-specific technique. Touch Surgery’s dynamic and interactive platform enables Episealer surgeons to practice the surgical technique at a time and place that suits their hectic surgical schedules. The Touch Surgery and Episurf Medical teams worked collaboratively to build a comprehensive training platform that replicates the unique benefits of the Episealer implant and instrument platforms. Three simulations allow the user to experience and virtually master the Condyle Solo, Trochlea Solo and Femoral Twin approaches. We’re honored to have partnered with Episurf to create a simulation for one of the most innovative procedures in knee orthopedics, available to anyone, anywhere in the world”. The global reach Dr. Nehme mentions can be seen in Touch Surgery’s user population, with users in every country in the world. “As a young dynamic med-tech company focused on innovation and surgical education, Episurf Medical immediately recognized the same qualities in Touch Surgery as a high-end provider of state-of-the-art surgical simulations. It has been a fruitful partnership and we are delighted with the outcome. Most importantly, the Touch Surgery platform will give us access to a global community of orthopedic surgeons previously unavailable to us”, says Rosemary Cunningham Thomas, CEO, Episurf Medical. Episurf Medical is built on the simple idea that each implant and surgical instrument should fit and be designed for each individual patient, rather than forcing patients to fit the implant. This is why Episurf have developed a next generation implant system that ensures a better outcome for painful joint injuries. Episurf Medical was founded in 2009 and develops and commercializes patient-specific medical devices for the treatment of painful joint injuries along with imaging solutions for surgeons, helping them identify and target a variety of bone and soft tissue pathologies.